Those planning to be out and about this weekend, be wary. 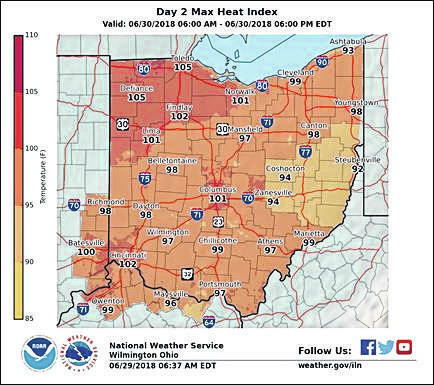 According to a weather statement from the National Weather Service in Wilmington, Ohio, as heat and humidity builds today the heat index will reach the upper 90s, with even warmer conditions possible for Saturday and Sunday. The heat index, which is determined by meeting points of temperature and relative humidity, signifies those enduring these conditions should use caution. According to Kim Carver, Scioto County Emergency Management Agency Director, Scioto County EMA is working closely with the State Emergency Operations Center and the NWS Office at Wilmington Ohio to keep the public updated on any heat products issued over the weekend. “Presently we are under a Special Weather Statement in Scioto County which is a Use Caution when being outdoors type of statement and we are urging folks to check on their neighbors, especially those without air conditioning,” said Carver. Carver advised that if conditions worsen, a cooling shelter will be provided to the public. “If we are upgraded to an advisory or warning we will open a Cooling Shelter during daytime heating hours until Near sunset for those who have no shelter options from the heat. Salvation Army will open up their barracks as a cool air conditioned place to take refuge in the heat of the day if the upgraded weather products of Heat Advisory or Heat Warning are issued,” said Carver. According to the weather statement, anyone planning on being outside should take frequent breaks, and drink plenty of fluids, and individuals are reminded to check on the elderly and people without air conditioning. The combination of high humidity and temperatures can lead to heat-related illness and even death. Heat stress occurs when the body cannot effectively cool itself. According to the Ohio Department of Health, conditions that can limit the body’s ability to regulate temperature in hot weather are old age, obesity, fever, dehydration, heart disease, poor circulation, sunburn and drug and alcohol use. According to the Ohio Department of Health, among those at highest risk for heat stroke or heat exhaustion are Infants and children up to 4 years, old people 65 and older, people who are overweight, people who over-exert during work or exercise, and people who are ill or on certain medications. Remember to stay hydrated, check on those most effected by high heat, and use sunscreen this weekend to avoid heat related illness.